The Stamp Act – Hey, Look! A Writer Fellow! And the Celebrate Stamp Saga continues. Are you not familiar with the Celebrate Stamp Saga? Well, it all began when I was forced to draw a “Celebrate Cats” stamp. The recipient of that cat stamp was the nine-year-old son of blogger extraordinaire Jilanne Hoffmann. The young man enjoyed my doodling efforts, I’m pleased to say, and, as a thank you, he sent me a hilarious, hand-drawn comic book and a “Celebrate Falling” stamp. In response, he has drawn a few more stamps that Jilanne recently posted on her blog. You get the picture, I think; I have just gotten myself entangled in a Celebrate Stamp Cold War. I suspect that I am outgunned. But it aint over yet! Watch your back, Hoffmanns. A Celebrate Stamp drone attack will be coming your way when you least expect it! On an entirely different note, April is National Poetry Month! Though I am not terribly well-versed (Ha! ), I do sometimes give the rhyming thing a go. For example, thanks to Vanessa Chapman and her inexplicable love of seagulls, I was forced to write an ode to head lice. Stopped his work to take a whizzle. Wait! Where are you going? There’s more! Does his still live there? I saved myself a stamp! See how I brought the post back around to the topic of stamps? Pretty good, eh? This is why they pay me the big bucks! But, seriously, Hoffmanns, you guys are going down. Next postShameless self-promotion? You got it! Gonna provide some Edward R. Murrow commentary, eh? I like that. It gives the upcoming battle some gravitas. I will be happy to contribute. Especially if your cards are printed on that elephant poop paper. Actually, that might be a good contest to hold over at your place. Don’t forget the one you did for my Librarians Are All That Contest last Wednesday, Mike! It’s terrific! I’ll save that one for next April. Here’s hoping I will have come up with a better rhyme for “decimal” by then. You’re right, of course — but shame on you for saying such a thing out loud! A stamps cold war, awwww love that! Smiles here! Yep. I’m taking part in the most pleasant war one will ever see. I think we’re going to have to invest in some armored postal trucks, some heavy gluing and licking devices (I guess you don’t have to lick them anymore, eh? ), and a semi-truck filled with paper and drawing implements. Art as weapons of war–but then poets are familiar with this approach. So apropos of you to include poetry in your declaration. I’ve got a post about “The Power of the Pen,” but that was purely the realm of poets (although images as political commentary were included, hmmmm). Of course the illustrators don’t want to be left out in (of) the cold (war)…so, ahem, I’ll leave you with that thought. I’ve got some strategizing to do with the young Master Hoffmann. 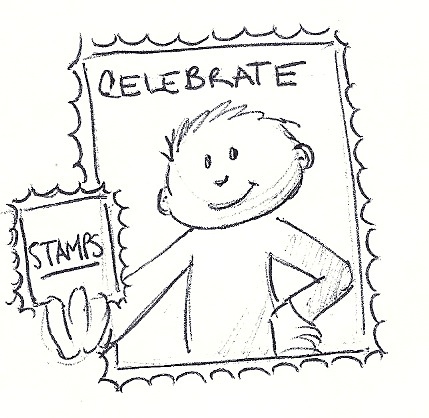 Perhaps someday soon we can do a joint contest, asking readers to contibute their own Celebrate Stamps. Considering that this so-called war has been described as “pleasant” and “cute,” it seems only right. I especially love the term “stampletes”. And Master Hoffmann, you’re going to need to get past that “cute” hate. Kids are always cute to their moms; that’s just the way it is and there’s not a ding-dang thing any one of us can do about it. My mom still tells ME I’m cute — and I’m a cranky old man! P.S. Ixnay on the Cold War. It’s a Cute War in my books! Cute and War are two words that are rarely used together. And isn’t that a shame? Oh that full circle stamps is so clever! You write very funny poems Mike. More! More! Well, we’ll see. Poetry-wise I will never be as prolific as you, my friend. That was very clever, Mike! You can twist a post with the best of them 🙂 LOVE the poem from Catherine’s blog – you made me laugh out loud and the kids aren’t even awake yet – what was I thinking? Looking forward to the continuation of the stamp war! Did my potty humor wake your children? That’s good! Share it with ’em! Kids do so love jokes about pee-pee. Before I could like and comment I had to check out your competition – woah do you have a worthy adversary my friend! Bring on the next battle of the stamps…and don’t spare the…felt-tip pens? Yep. That kid is funny and prolific. This may just be my doodling Waterloo. When I’ve thrown in the towel, I will do a Celebrate Custard stamp. I’m ROFLing…You HAVE to draw that one!! That kid’s stamps are amazing. I’m going home to celebrate my brick wall. Excellent. Just don’t drive your car into it. Not much to celebrate on that score. Totally agree! Even if not now, someday! We definitely do need a new Shel Silverstein for this generation! I’ll give you a soft confirmation for “someday,” OK? Hey, better late than never, my friend! And do feel free to check out the month’s worth of posts you so brazenly chose to ignore. Harumph! I’m even later than the weebs to this post! I hope that better late than never applies to me too! You mentioned me in your post and yet I dragged my heels and just ambled over a week later. 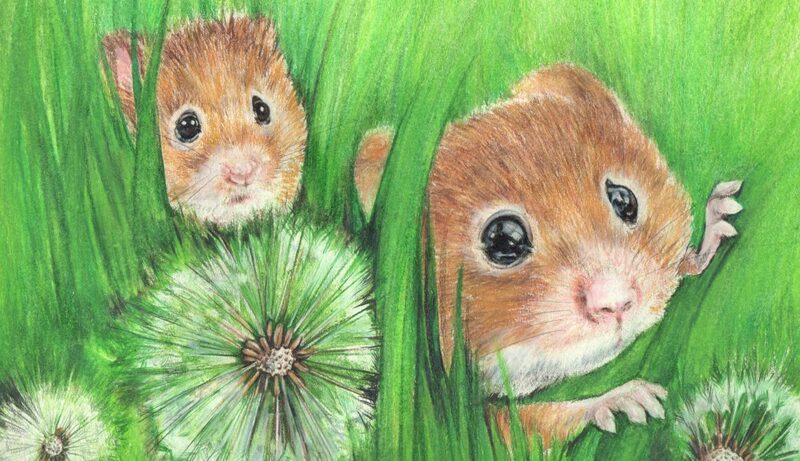 Your poems are fab, I really did sing the jingle bells one out loud too! Better late than never applies to all. But since I mentioned you in the post, you must receive a double-harumph. Wow between Mr. Hoffman’s stamp collection and your poetry it’s like reading an issue of Mad Magazine!